St. Mary the Virgin, Chislet is a unique and unusual local landmark. 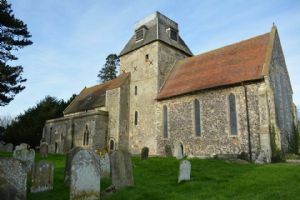 Nestling in amongst a cacophony of ancient yews and crumbling gravestones it is first and foremost a warm, welcoming church, with a small, but growing faithful congregation. In 1986 the Chislet Centre was completed, after the pews from the Nave were removed, to make way for toilets and a kitchen. The Chancel remains dedicated to worship and the sacraments, while the Centre, (located in the nave) now offers space for meetings, receptions and certain sports. The primary school regularly use the space. St Mary the Virgin, Chislet is a beautiful, idyllic country church, complete with wonderful stained glass, an ancient baptismal font and a quaintly pretty organ. Her congregation celebrate their faith with a range of services covering the traditional Book of Common Prayer, Inter-generational worship and Pet Services. They would love to welcome you! Our picturesque Church lies at the heart of a sprawling rural parish of 6,835 acres, consisting of the five small hamlets of Highstead, Boyden Gate, Marshside, Chislet and Upstreet whose combined, though scattered, population numbers around 903, with 322 households. The thriving parish school is located just opposite the church, where the number of pupils with special educational needs and/or disabilities is above the National average. 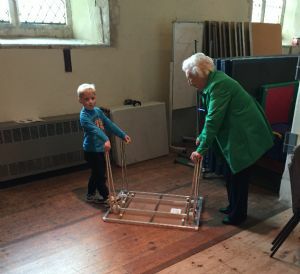 The Church of Chislet has begun renewing old links with the Marshside Methodist Chapel, and the two congregations continue to reach out in quiet ways to the wider community, of which they are an integral part. Chislet and her close neighbour Hoath share a monthly Parish magazine detailing events and fund raising activities. Chislet’s church, dedicated to St. Mary, is a picturesque example of the rural parish church. Set amidst a churchyard of leaning gravestones, it retains to the glory of God a beauty worthy of an artist’s sketchpad. From an historian's point of view St. Mary’s is of considerable note. King Ethelbert granted the original manor of Chislet to St.Augustine’s Abbey in 605AD, and today the oldest parts of the present church date from before the Norman Conquest. Complete with triplet east windows, adorned with modern stained glass, the chancel is filled with an understated serenity. 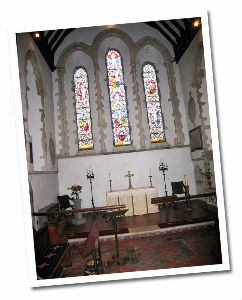 An pretty organ crouches to one side; carefully stitched hassocks lend splashes of colour. The simple altar, complete with its cross, witnesses to the saving grace of God. Dividing the chancel from the tower, a magnificent archway presents a splendid example of Norman zigzag architecture. The nave remains uncluttered, thanks to its dual purpose as a community centre, but it’s certainly well worth noting the lofty king-post roof and the unusual tympanum adorning the lintel of the door to the belfry. The nave is an invaluable community centre, providing a wonderful space for receptions, sales and badminton. St. Mary’s church is steeped in history, years have rolled past, the future stretches ahead, but Jesus Christ truly is miraculously present in this place.